Why isn’t George R. R. Martin on Twitter? Because he killed all 140 characters already. The final episode of Game of Thrones fifth season saw the demise of the 998th Lord Commander of the Night’s Watch, branded a traitor, and stabbed in the gut by the very people he called his brothers in a very Caesar-like fashion. Et tu, Olly? Plot Armor (WARNING: TVTropes link) does not exist in Westeros or Essos. Even the perceived hero from the first book/first season of the series, Eddard Stark, was brutally beheaded by the brat king Joffrey Baratheon. Your favorite characters aren’t safe. The book and show series leaves us with Daenerys and a wounded Drogon found by a big khalasar, Arya literally blinded by her mistake, and Sansa falling towards snow which would hopefully cushion her fall. I guess the only one we should root for now is Ramsay Bolton, huh? So in appreciation of the flaws and follies of Lord Commander Jon Snow, here are some Jon Targaryen Stark Snow fan art from around the web. DISCLAIMER: All images are owned by their respective authors. UCreative does not claim ownership to these images. 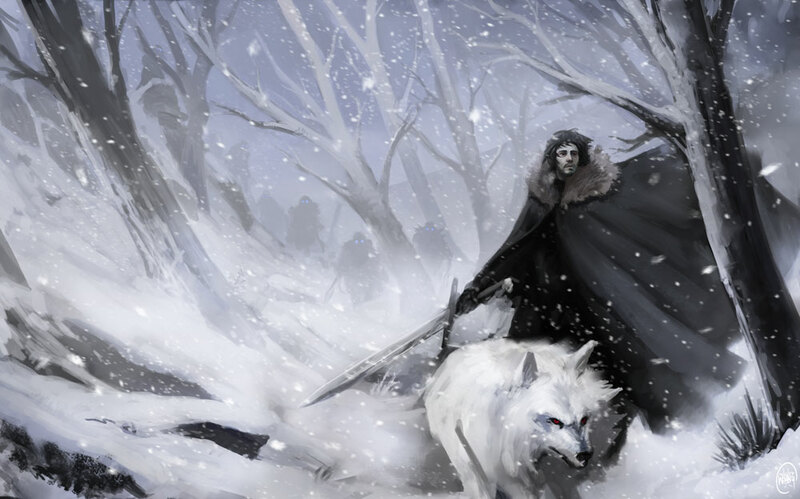 Do you have your own Jon Snow fan art? Submit them here!